Recently the UK decided to reinforce it's rules against sending flammable liquids overseas, so a lot of nail polish orders were getting held at the postal offices and subsequently getting destroyed. This happened right around the time A England ended its 2 year anniversary promotion so several international orders were in jeopardy. Luckily, Adina, the owner of A England came up with a plan to use her overseas courier to batch send the orders to her third party sellers to divvy out and send individually. As a result, I happily received my order the other day with everything intact. Way to go A England for thinking under pressure and coming up with a great solution! The first of these polishes is Princess Tears, a silvery lavender holo. The formula was a touch thick, which I believe is normal for holos in general. It was almost a one layer polish but I still had some tiny bald patches so I used two. An aquabase could have probably kept it at one layer but I didn't use one. It dried semi-matte on its own and I left it without topcoat so you can see. The first pic is in my light tent, the rest are under direct light so you can see the holo flare. 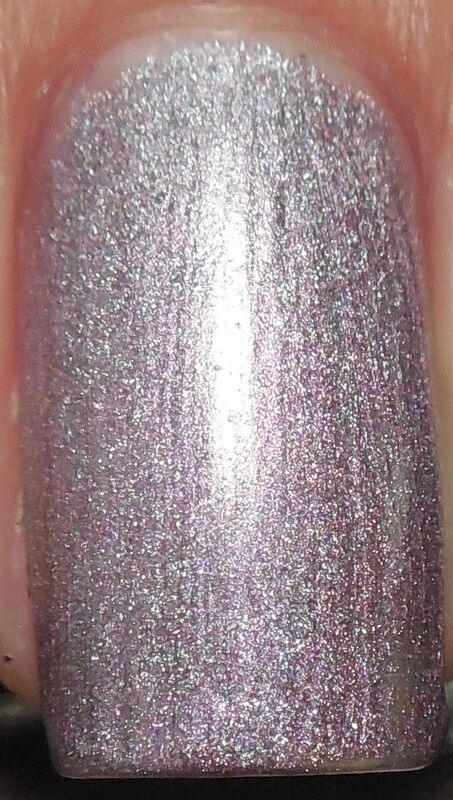 As you can see, the holo is really subtle in this shade. It's stronger IRL but not by much. Compared to Dragon and St George, I'd have to say that I'm disappointed in this shade. It doesn't have the same holo effect as the other two. The color is pretty and I like the semi-matte effect, but it's not going to be a holo that I'll reach for when I'm in the mood for a good lavender holo. Do you have a holo similar to this shade that performs better?